Here in one short editorial article, Hugo Gernsback outlines the application of shortwaves in 'the next war' to maintain wireless surveillance of the airspace over towns and cities via what is essentially radar, to detonate explosive devices by means of a powerful 'special combination impulse,' and long-distance wireless communications via radios 'so small that one man can easily carry it.' This might seem rather moot in today's world, but in 1935 it required a certain amount of knowledge of wireless communications and a vision regarding its potential. In my readings of a great many early- to mid-20th-century technical articles on electronics, aeronautics, physics, etc., it is interesting to notice how authors of the pre-WWII era referred to what we now call 'World War I' as simply 'the World War.' That is because at the time it was the only known world war - defined as a conflict that involves most of the principle nations of the world. During the World War, the vacuum tube had just begun to make its appearance and it was not until the end of the war that really good vacuum tubes had been perfected. Short waves at that time were not much in vogue and had only been used experimentally. Not very much was known of their behavior in space and whatever signaling was done during the war was done at the higher wavelengths, rather than on short waves. The next war will see profound changes in all branches of warfare and one of the most interesting ones will no doubt be that involving instrumentality of short waves. 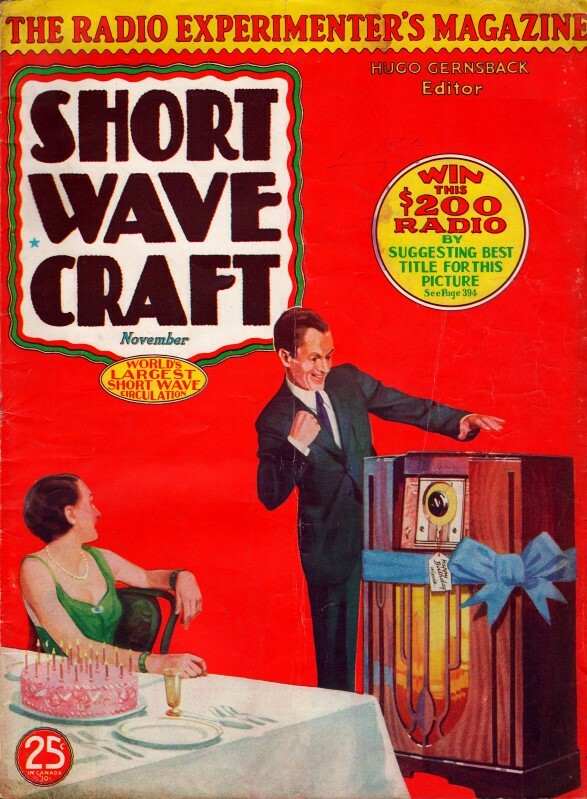 Short Wave Craft has repeatedly chronicled the latest inventions used in conjunction with short waves. Recently the so-called mystery ray has been given quite a good deal of publicity in the press. It seems this particular ray, which is nothing but micro short waves, was simultaneously developed by the United States Army, also in Germany, and by several other powers as well. These micro waves appear to pierce fog and even clouds, and work along optical lines. It will be impossible hereafter for an airplane to hide in the fog and even behind clouds, because the mystery wave directed against it is reflected down to earth where it is used for recording or alarm purposes. A city, during the next war, will easily be protected against unheralded enemy aircraft by having a barrage of such micro waves surrounding the entire city, the action being automatic in such a manner, that automatic recording instruments will immediately sound the alarm when an airplane appears overhead within the confines of the city. It will be impossible, in the future, for an enemy airplane to get through such a short-wave barrage. This, however, is only one of the more spectacular war uses of short waves. For propaganda purposes all of the short-wave stations of the various nations will be worked at full blast! One nation will outshout the other, in trying to tell the enemy population certain war facts which the home government may wish to suppress at all costs. We will then have the interesting experience where one government, in order to defeat this purpose, will try to "jam" the enemy station from sending out such propaganda by broadcasting on approximately the same wave. This would then nullify the enemy's efforts because listeners could no longer make out what the foreign messages were. For communication purposes, between Army units, exceedingly short short-waves will be used; each battalion will have its own short-wave set, which will be so small that one man can easily carry it. In this manner it will be possible to keep in touch with headquarters all the time. Of course, it will be argued at this point that the enemy will hear all these messages. This is true, and it should not be forgotten that we also hear the ones from the other side as well. This need not disturb us, because the messages can be in special codes, so that if the enemy gets the information they will not be much the wiser. These codes are changed quite frequently so that the enemy cannot understand them. However, when it is necessary to keep the messages secret, we will make use of special directional or radio beams, which can be directed exactly the same as a searchlight, with the assurance that the enemy cannot eavesdrop on the message. It is to be expected that such directed beams on ultra short waves will come into general use during the next war and, as a matter of fact, practically all armies have experimented with the system and several have adopted ultra short waves for such communication. The same reasoning holds true for airplanes. Here also, special equipment, whereby an airplane can send out a sharply focused beam wave, which cannot be intercepted by the enemy if the usual precautions are taken, will be used. It will even be possible for outposts, where it is impossible to use telephone wires, to employ short waves for communication purposes to the rear. Short-wave sets have already been designed which can be carried on the back of any soldier. These are usually small battery operated affairs that weigh a fraction of a pound. The operator finds it easy to direct the micro wave back to his own lines, so that the enemy cannot intercept the message. This is also done by special beam-reflector work. These ultra short waves will also be used where small mines, planted in the soil, can be hidden at strategic points, bridge approaches, etc., ammunition dumps, and wherever necessary. By a special combination impulse, the mine can be exploded at any time, although a special formation of signals are necessary before this can be accomplished. No wires are used, and the destruction can be effected especially during the retreat of troops in order to hamper the movements of the enemy. There are, of course, hundreds of other uses of short waves for warfare purposes, many of which are secret and about which little or no publicity has, as yet, been given.